District Engineer David P. Adongay Jr., (center-right) presiding over the staff meeting with Assistant District Engineer Alfredo L. Bollido (center-left), Section Chiefs, Unit Heads, Project Engineers and Staff on August 9, 2018 at DPWH Conference Room. 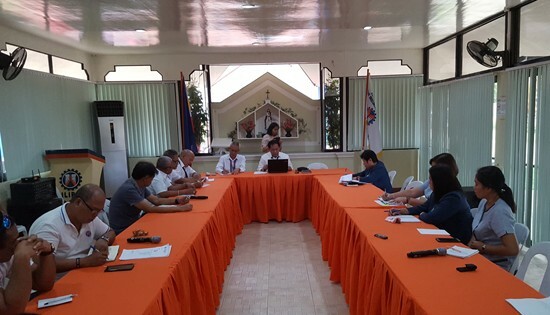 One of the highlights of the meeting is regarding on the implementation of 2019 Cash-based budgeting System. NAVAL, Biliran – The Department of Public Works and Highways (DPWH) Biliran District Engineering Office (BDEO) has a total allotment budget of P1.2B including region wide projects for year 2019 project implementation based on National Expenditure Program (NEP). David P. Adongay Jr., District Engineer disclosed that out of the allotted amount, the district office will only implement P813.9M while P397.9M will be implemented by the DPWH Regional Office VIII. This is 30% lower than the 2018 General Appropriation Act (GAA) budget amounting to P1.6B. Engr. Rosario B. Rosete, Chief of Planning and Design Section said that BDEO has 61 total proposed projects for 2019 with 56 projects to be implemented by the district office. Rosete added that out of the 56 projects, 12 are already surveyed and three Plans and Program of Works (POWs) are already completed. Preliminary and Detailed Engineering (PDE) activities are on-going for the remaining projects. “We can already advertise all projects by August this year,” Rosete said. According to Adongay, the department is rushing all Regional and District Offices to complete the detailed engineering activities on projects based on NEP to easily implement the same by next year under the cash-based program. In 2019, the government will be shifting from obligation-based budgeting system to cash-based budgeting system which means that implementing offices has given only one year to finish all projects based on the respective budget allotted. “Our aim is 100% completion in 2019, although not practical but that is reality,” Adongay said. “If we want to move ahead, we should shift our paradigm,” he added. Adongay said that proposed projects in NEP are just minimum proposed projects and should expect changes for additional projects upon approval of the General Appropriations Acts (GAA).